We need to stop the chemtrail spraying of Sonoma County and the entire state of California ASAP! Chemtrails, Chemical trails or Aerosol spraying, are a very real threat to Sonoma County, and humanity on a global scale and must be stopped. Recent water samples taken from the Mt. 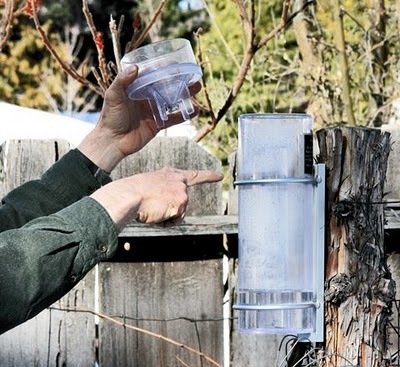 Shasta area indicate high levels of aluminum found in rainwater samples. Shown here is a rain guage where the most recent samples were taken. Several Mt. Shasta area residents continue to express their concerns over what they say are toxic levels of aluminum showing up in area rain, snow and pond water samples taken in and around the City of Mt. Shasta. Recent test results submitted to the Mt. Shasta Area Newspapers by two concerned citizens show levels of aluminum ranging from 198 ug/l (micro grams per liter) to 61,100 ug/l, with the most recent sample taken from a rain gauge within the Mt. Shasta city limits on Feb. 1, showing 1010 ug/l. According to standards established by the California Environmental Protection agency, this number exceeds the 1000 ug/l Primary MCL maximum contaminant level) for aluminum, qualifying it as unfit for drinking. The concerns over the apparent high levels of aluminum first surfaced last spring, as a small group of Siskiyou and Shasta county residents began expressing their alarm over what they claim is an aerial spraying program intended to control the weather or thwart global warming. The issue, commonly referred to as “chemtrails,” is seen by many as nothing more than an internet hoax. Others, however, claim that the lingering plumes of exhaust from planes is part of a world wide program to create a heavy metal “shield” in the atmosphere. Beginning last spring, some area residents began asserting their consternation over the long lingering clouds seen throughout the area. Proponents of the theory say that contrails, the normal water vapor emitted from jet engines, dissipate quickly, while chemtrails linger for up to half a day, often morphing into a cirrus cloud- like canopy, creating an overcast sky. The regional testing for aluminum began over claims that the exhaust trails consist of aluminum, barium and strontium. Since May, 2008, over 40 samples have been collected, with the majority showing high levels of aluminum. “This rain water is essentially poisonous,” said Frances Mangels, one of the citizens involved in the sampling. Mangels has expressed his concerns to local governments and state and federal agencies but has heard no responses to his inquiries. Perry LeBeouf, a California Department of Water Resources data officer, said the MCL level for any given potential contaminant is typically used to evaluate factors relative to the quality and safety of drinking water systems. LeBeouf noted that most of the tests for aluminum are done in and around drinking water systems and that there is not a lot of information about aluminum in natural water systems or rain and snow water. According to LeBeouf, “Aluminum is not very well understood.” He also emphasized that it is a commonly found element and that the levels vary from area to area. This sentiment was furthered by Siskiyou County Air Pollution Control Officer Eldon Beck, who said that aluminum is not something that is regularly tested in Siskiyou County other than the drinking water system requirements. Beck noted, “I’ve read reports that there are naturally recurring amounts of aluminum in the atmosphere,” furthering the sentiment expressed by LeBeouf that the samples, while interesting, need more background information to be fully understood. “I’m fascinated by these numbers and would like to know what this area looks like compared to other areas (in terms of aluminum content in the water),” said Mt. Shasta biologist Rene Henery, who noted that he was not aware of any baseline data for this element in the region but had his concerns that they numbers are high relative to the CEPA primary MCL standards. “Aluminum is definitely super-toxic,” he noted. One point noted by LeBeouf was that it is not just a question of how much aluminum is in the water. “The PH level of water is also a factor,” he said, noting that there is a broader context that needs exploration whenever sampling occurs. Guy Chetelat of the Central Valley Water Quality Control Board, one of the primary agencies involved in regional surface and groundwater issues, noted that his agencies had little information about aluminum levels in water. He said he was aware of the concerns being expressed by Shasta and Siskiyou County residents. “There’s a level of public concern around this and we are looking into it,” he said. The concerns around aluminum were presented to the Mt. Shasta City Council this past summer as well as the Shasta County Board of Supervisors. In both cases, the governing bodies chose not to further investigate the issue, questioning the validity and scope of the tests, as well as their respective jurisdictions over the issue. Are there any government or reputable agencies that have conducted testing? Your article makes all this sound very plausible that our drinking water is toxic. Couldn't you provide the other side of the story? High levels of Silver (Ag), Barium (Ba) and Strontium (Sr) and low levels of copper (Cu) have been measured in the antlers, soils and pastures of the deer that are thriving in the chronic wasting disease (CWD) cluster zones in North America in relation to the areas where CWD and other transmissible spongiform encephalopathies (TSEs) have not been reported. The elevations of Ag, Ba and Sr were thought to originate from both natural geochemical and artificial pollutant sources--stemming from the common practise of aerial spraying with 'cloud seeding' Ag or Ba crystal nuclei for rain making in these drought prone areas of North America, the atmospheric spraying with Ba based aerosols for enhancing/refracting radar and radio signal communications as well as the spreading of waste Ba drilling mud from the local oil/gas well industry across pastureland. These metals have subsequently bioconcentrated up the foodchain and into the mammals who are dependent upon the local Cu deficient ecosystems. A dual eco-prerequisite theory is proposed on the aetiology of TSEs which is based upon an Ag, Ba, Sr or Mn replacement binding at the vacant Cu/Zn domains on the cellular prion protein (PrP)/sulphated proteoglycan molecules which impairs the capacities of the brain to protect itself against incoming shockbursts of sound and light energy. Ag/Ba/Sr chelation of free sulphur within the biosystem inhibits the viable synthesis of the sulphur dependent proteoglycans, which results in the overall collapse of the Cu mediated conduction of electric signals along the PrP-proteoglycan signalling pathways; ultimately disrupting GABA type inhibitory currents at the synapses/end plates of the auditory/circadian regulated circuitry, as well as disrupting proteoglycan co-regulation of the growth factor signalling systems which maintain the structural integrity of the nervous system. The resulting Ag, Ba, Sr or Mn based compounds seed piezoelectric crystals which incorporate PrP and ferritin into their structure. These ferrimagnetically ordered crystals multireplicate and choke up the PrP-proteoglycan conduits of electrical conduction throughout the CNS. The second stage of pathogenesis comes into play when the pressure energy from incoming shock bursts of low frequency acoustic waves from low fly jets, explosions, earthquakes, etc. (a key eco-characteristic of TSE cluster environments) are absorbed by the rogue 'piezoelectric' crystals, which duly convert the mechanical pressure energy into an electrical energy which accumulates in the crystal-PrP-ferritin aggregates (the fibrils) until a point of 'saturation polarization' is reached. Magnetic fields are generated on the crystal surface, which initiate chain reactions of deleterious free radical mediated spongiform neurodegeneration in surrounding tissues. Since Ag, Ba, Sr or Mn based piezoelectric crystals are heat resistant and carry a magnetic field inducing pathogenic capacity, it is proposed that these ferroelectric crystal pollutants represent the transmissible, pathogenic agents that initiate TSE. Dec 09, 2010 – Sonoma California Chemtrail spraying. Recorded on June 22, 2010.
huge chemtrail strip directly over the city of santa rosa, CA. 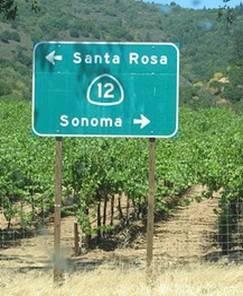 sonoma county . and a sea of chemclouds. church bells. documenting the sonoma county chemtrail onslaught, i thought i was filmimg a chemtrail .